Exchange as many files as you want with just one click! The Windows-integrated file manager called Windows Explorer offers multiple options to cut, to copy and to paste files. Anyway, whenever you try to overwrite single files that are located in many different folders you first have to find them by your own and then paste a source file you copied before. This can take much time, and since the number of files on big hard drives grows all the time, most Windows users are not able to manage their file system good enough to do such replacements correctly. In the end documents, images, songs and videos with the same or similar content in different versions are spread all over your hard drive and even you by yourself will not know where the right one is, or the biggest one or the latest one. 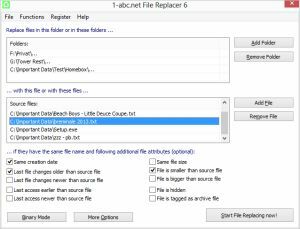 1-abc.net File Replacer helps you to update your whole hard drive, USB stick, camera card or network. You add a path or paths where the program should check for possible replacements, you add a source file or source files and then you determine by your own when such a batch replacing shall be done. Besides same file names you can define such files as ones with same creation date, earlier file access than the source file, smaller file size than the source file and much more. A replacing report is written to a history file automatically to let you see what files were exchanged. And if you think that you want to do file replacements with the same options again, you can load and save replacement projects, define current settings as default or let the program start automatically from time to time. Updating your file system by exchanging files can be very complicated. 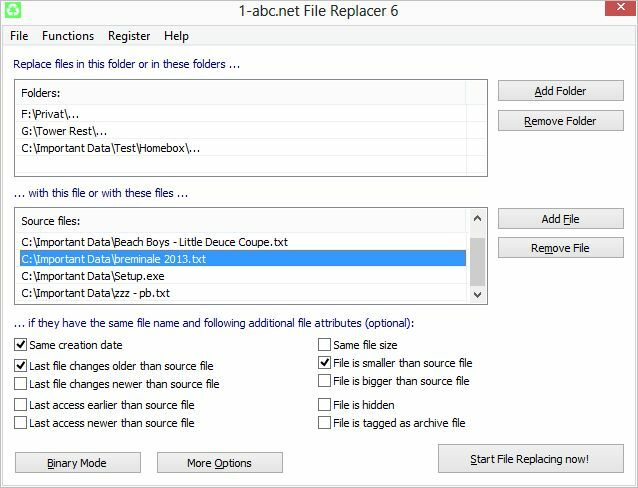 With 1-abc.net File Replacer this is just one click and you can save so much time for more important things in life!